While I was in the states last fall, I saw (actually I was cutting up the yardage into panels for my sis) these panels and loved them! In order to appreciate them, however, you have to see them up close. They are an “I Spy” panel. I wanted to make them a bit bigger, so my daughter in law and my niece could use them as play mats for their little girls. I simply added bright borders!!! This way I didn’t spend a lot of time on them but they are so cute! They can sit on them, drag them around, look for the things on them and I’m fine with that. That’s why I made them! I went with that bright red hexagon fabric around the outer edge because it is so fun! And bright! Around the edge of the main panel are the words which tell you what to look for. Then, just like “Where’s Waldo”, or any hidden things search ‘n find type of puzzle — you look for them! I made up two - one for my granddaughters and my grandnieces! If you want to get this panel, my sis has them for only $8. My sis is starting out with 15 of these panels at this time. If you want one, get it now. It’s here. This is a very nice panel by Elizabeth’s Studios and you won’t be disappointed. The quality is great, the colors are deep and it is wonderful to the touch! 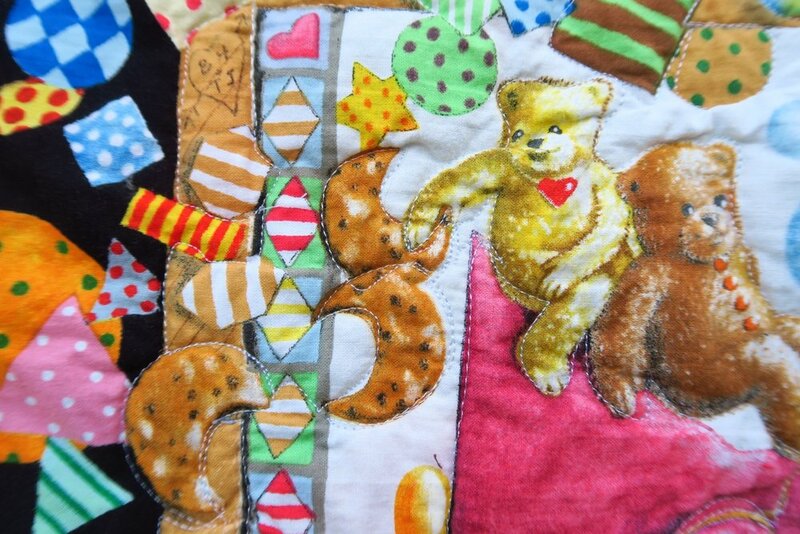 It makes into this fantastic children’s play quilt in a jiffy! And now you know! This was one of those projects I started last fall but just now finished! The fabric is crinkly almost as though it has been pre-washed. However, this was part of a destash lot, so I don't know whether it was pre-washed or not. There is nothing Christmasy about this fabric, so feel free to use it in any gorgeous quilt pattern. It's stunning. Blue dots are 1.4 cm in diameter, giving the illusion that they are larger than they really are due to the large amount of white space between dots. White Polka-Dots are 7 mm across.